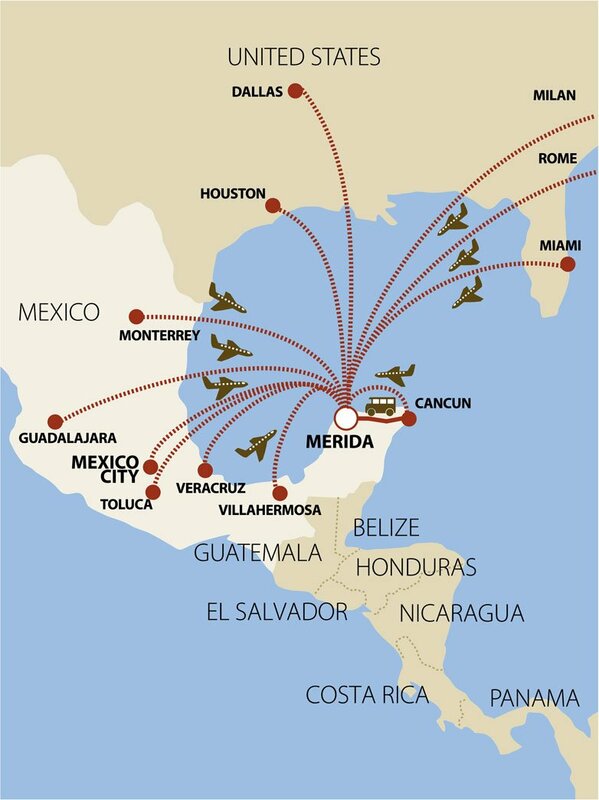 Below, please find a series of options to fly to MÉRIDA. Also feel free to ask your travel agent to find the route that best suits your needs. From the Cancun International Airport to the city of Mérida, you may catch a domestic flight to the Mérida International Airport or you may arrange for ground transportation. Consult schedules and fares at www.ado.com.mx and even make your reservation for direct transfer to the Congress venue hotel (Fiesta Americana). Note: Schedules may vary, so please check the website in advance. Official transportation operator at the Cancun Airport, the Company offers exclusive transfers in vans, Suburbans and limousines. Check schedules and prices at https://es.cancun-airport.net/transportation.php, and make your reservations right there, too. We advise against using non-official transportation offered by individuals upon your arrival at the airport, since this is against the law. Remember to make your reservations only through an official provider and prior to your arrival in Cancún. In any case, please keep us informed of your flight plans so we can help you with your itinerary and transfer to the main hotel or any of the alternative hotels.